Madrid is an elegant city, conservatively dressed with grand boulevards and plazas, world-class art museums and leafy green parks. Yet, underneath the refined image, Madrid is a city that also knows how to party, to let loose and stay up late. Lucky for us, here is another indie dispatch from Daytripper’s regular bohemian contributor, Brooke, who just spent a few days in Spain’s capital. Stay: Centrally located in the city center, ME Madrid is sleek and contemporary with stunning city views, especially from its seasonal, trendy rooftop bar. With a cocktail lounge on its ground level and an excellent restaurant this is a stylish stay. Coffee: Start your morning off with a cafe con leche from Cafe Fabrica. This bookstore, gallery, cafe hybrid offers a delicious way to satisfy your caffeine fix while surrounded by locals. To go with the coffee, get a tostado with tomato y jamon and check out the artwork in the adjacent room. The gallery features modern photography and mixed media images as well as an assortment of fun art books, bottles of Spanish wine and eclectic home decor. Fabrica is a must for any art lover. Chill: Forget the siesta back at the hotel; instead take some time to relax at Buen Retiro park. Sit by the water at this absolutely gorgeous park while you soak in the Spanish air. You can rent rowboats for just six euro a boat; it’s a beautiful way to spend the afternoon. Regal: Another place worth visiting is the Palacio Real de Madrid, the official residence of Spain’s Royal family. It may not have the ceremony of Buckingham Palace’s changing of the guards, but it is still gorgeous and surrounded by beautiful gardens. Transplant: Before heading back to the hotel, right near the Palace, check out the Temple of Debod, a gift from the Egyptians. This ancient temple was brought to Spain and rebuilt in Madrid in 1968 in this picturesque park. Drink: Don't even think about missing an awesome Spanish sunset. 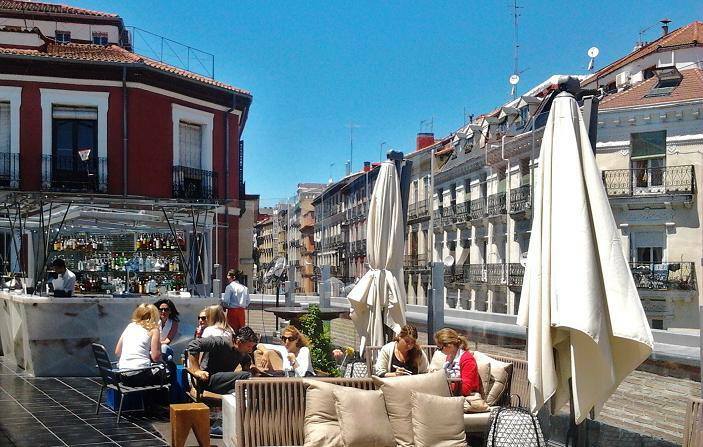 Plan on heading to Chueca, a cool Madrid neighborhood, for drinks on the rooftop of the Mercado San Anton. The cocktails here are artfully made, the ambiance is incredible and the views are spectacular. Dinner: For a traditional evening, sip an aperitif and watch the world go by at one of the cafes in the Plaza Mayor before heading around the corner to one of Madrid’s most classic restaurants—Casa Lucio for huevos estrellados. Ten Con Ten is trendy, both upscale and casual at the same time with excellent food. For another hip spot, book a table at Ana la Santa. If you haven’t had your fill of food markets you’ll have a ball at Platea, a multi level extravaganza with a restaurant, a market area for tapas, a bar and a club. Fun!